2' 0" h, 12″ dia. Early on I wondered if I’d ever get my glass art to approach the confounding degree of difficulty of some of my wood pieces. 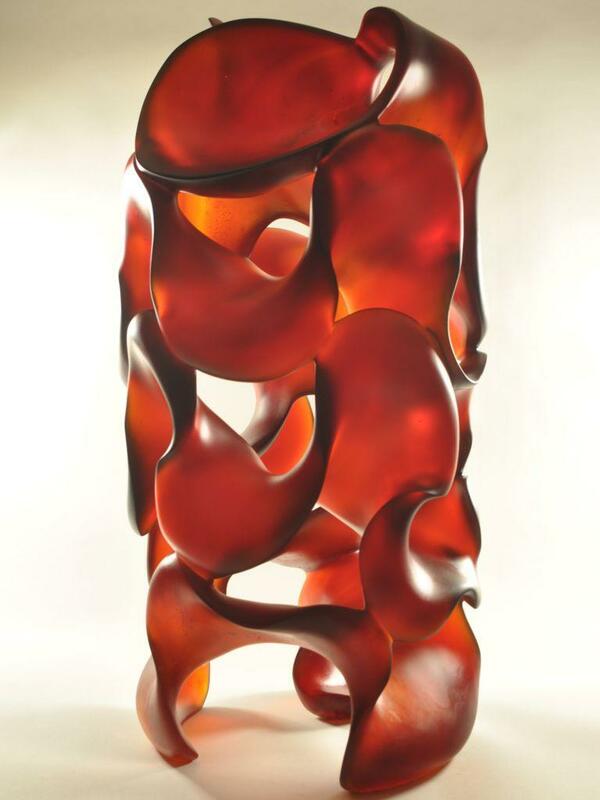 Meet my hard-fought, parity-achieved glass sculpture, Fluid Dynamics! Just before starting this piece, I was asked to make a presentation about my transition story from wood art to glass sculpture. I talked and showed images of both art forms. During Q&A someone from the audience asked if I thought I had achieved parity between the disciplines compared to my wood pieces like Gaia, Up Draftand Down Force. I admitted that I had not, but I felt it was coming. In fact, I thought to myself, it might not be possible given the structural limitations of glass and the kiln casting process. But I felt challenged to try. I am always up for a good challenge, and, in fact, seek it out. This is the way to grow – to be better. In fact, it almost was not possible. The description below will be longer than usual and the images nested to better illustrate the copy…and to give you a behind the scenes look at the improbability of Fluid Dynamics. I wonder how many times I have said, “This is my largest piece to date”? The Fluid Dynamics wax cylinder (pictured with initial design lines sketched on) was 2 feet in height, 1 foot diameter. 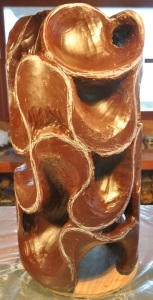 The piece took three months to sculpt, progressing along toward the finished wax that went to the foundry in June 2012. In September 2012, I got word from the foundry that the mold failed in the kiln under 1500°F temperature and 70 pounds of fluid glass weight. It split open in the middle – ten pounds of glass had leaked out the sides of the mold, ten pounds redistributed itself within the mold. Another partial outcome was that 6 inches of the piece did not get filled with glass. To understand this next explanation and the images, you need to know and visualize that the foundry cast the piece “up-side-down.” So it was the bottom 6″ of Fluid Dynamics that was missing, as I will point out in the following images. After the work cooled down from the kiln, the foundry began “remedial” action. They poured melted sculptural wax into the 6″ missing-glass void. Then they waited for it to cool before “divesting” (removing the plaster). They were taking a chance that the original form was still in the mold. And it was! So what you see at the top of the image is the bottom of Fluid Dynamics with the non-transparent, cooled replacement wax sitting atop the already-fired red glass. Top at left…filled with replacement wax…and unwanted glass clogging the negative space. The next image shows the piece on its side, with the top at left, bottom on right where the replacement wax is, after complete divesting. 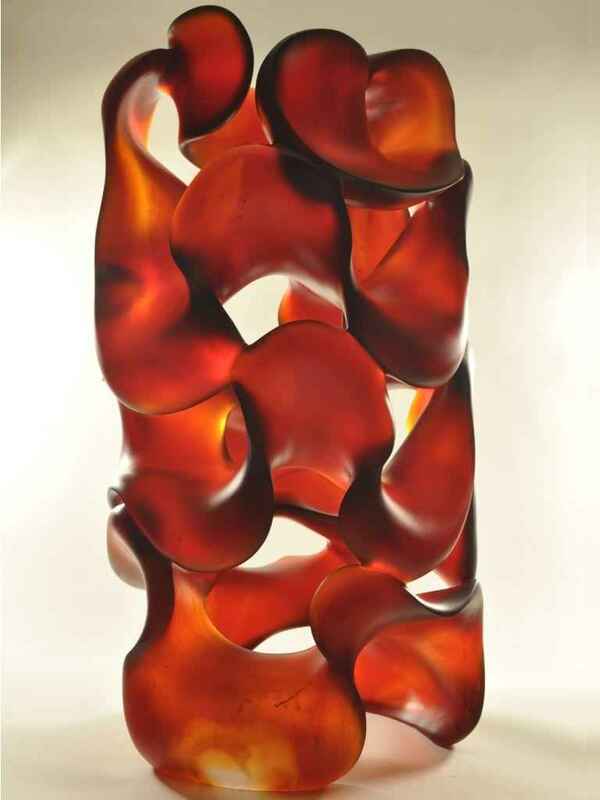 Sheets and filaments of unwanted, excess glass remained attached to the piece, clogging the negative space. That’s the rough, chalk looking stuff you see at center of the image. The foundry had to cut off and clean up all of that before proceeding. Then the piece had to be reinvested in plaster and run back through the entire firing process a second time in order to replace the 6 inches that were lost in the first firing. Still needs sanding & a bath…but the piece (and I) survived! I received the piece back in June 2013. It was all still there, but every inch of it was horribly distorted and the lower half of it had collected the other 10 pounds of lost glass. Instead of a wall thickness between three-quarter inch and 1 inch originals, they were now between 1 1/2 inches in 2 1/2 inches thick. All that glass had to be ground off and all the original lines and planes had to be reestablished. But it turned out this is one tenacious piece! It did not just want to make it into this world, it challenged me to make it the best it had originally started out to be! It took me nine weeks of “cold working” (grinding and sanding) the piece, under a certain amount of pressure since it was scheduled for a gallery reception mid-September! But we (the piece and I) made it. I feel the piece is visually impressive, artistically compelling and technically over-the-top. I feel I have achieved technical parity and hope I have gotten over this phase of having to prove something to myself. The physical agony of having to work deep inside its confines will take a long time to heal. Now that the finished images are available, I hope you enjoy Fluid Dynamics.